There is a place in Florence where you can see contemporary works of art together with a Renaissance temple. Mix everything into a former Medieval church, and what you get is the Marino Marini Museum, one of the many overlooked attractions of Florence Italy. There are no crowds here like in the Uffizi or the Accademia, but the works are amazing. The Marino Marini Museum is part of the attractions that you can visit with Firenze card. If you want to experience as many museums as possible while you’re in Florence, visiting the Marino Marini Museum allows the public to take a deeper look into the mind of this artistic genius. The museum only has one purpose, it’s intention was to keep the works and philosophy represented within Marino Marini’s work alive; they just want every single generation possible to take a look at what he’s been able to create. The support and upkeep of the Museo Marino Marini museum are most important here, the museum itself is located in the former San Pancrazio church. Contemporary artists like this one don’t come around that often, which is why the conservation of Marino Marini’s projects are so important. The building itself is almost like a work of art because it was previously a church. We all know that Florence is filled with churches, but none of them are going to offer up the kind of experience that Marino Marini Museum does. It’s in the heart of Florence, located directly in the middle of the historical center. This is the area that’s between Via Della Vigna Nuova, as well as Piazza Santa Maria Novella (two places in the city of Florence that are quite easy to spot/find on a map). This particular church charts all the way back to the 6th century (A.D.), and was morphed into a priory after the year of 1100; this is due to the fact that a large amount of renovations had taken place – at the hand of the Vallombrosan monks, of course. The Benedictine nuns had originally called this place their own, but the monks took over shortly after the nuns run had come to an end. The building has had a few mishaps happen to it up until the year of 1988 (it was being desecrated on a consistent basis). At one point, the church was actually turned into both a tribunal and a tobacco factory, until a fire took away the masonry on the apse. At one point, Florence simply used it as a military dumping location. The year of 1988 was a great one for this particular church because it’s when contemporary art started to breathe new life into the property. It takes a lot more than a few renovations to change the way people look at a building, it takes an entire community to come together and create something new. As soon as contemporary arts had taken over the church, the past seemed to erase itself; people stopped taking the time out of their days to destroy it piece by piece. 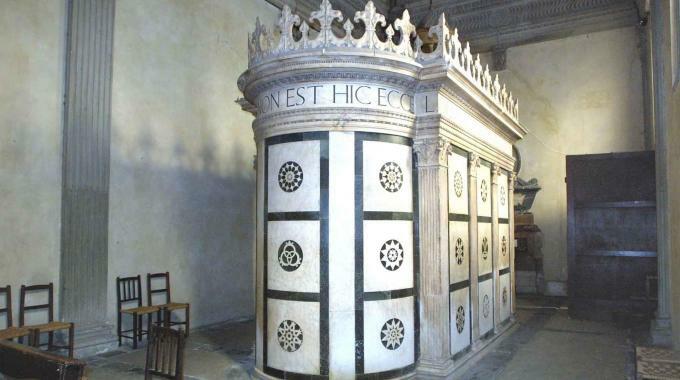 The church also offers the Rucellai Chapel, a renaissance chapel designed by Leon Battista Alberti, also known as the chapel of the Holy Sepulcher because the tomb is indeed inspired to the sepulcher in Jerusalem. 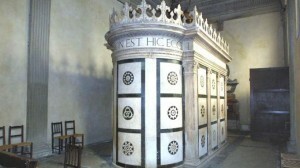 Giovanni di Paolo Rucellai was the key component behind this chapel for the 15th century, as he had a patronage to his family within the main chapel of the church. This building has seen a lot during it’s time on this planet, and it fits the Museo Marino Marini perfectly; it’s an amazing experience located in an amazing setting.